Honestly, it couldn’t have gone to anyone else. This year the Academy Award for Best Director went to Mexican director Alejandro Iñárritu for his exemplary work on The Revenant. It was a crowded field and anyone could have won, but at the end of the day the award once again went to Iñárritu. As incredibly easy as it would be to say that we didn’t see this coming, that simply would not be the case. 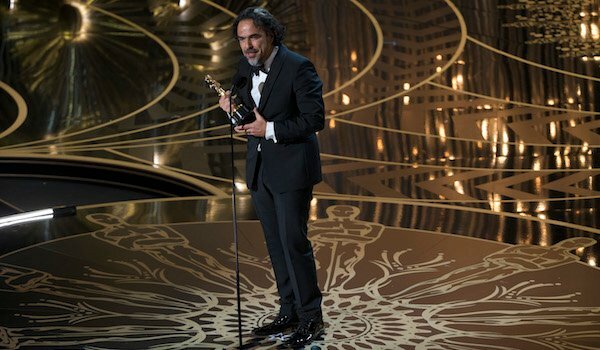 We really cannot say that we are surprised to hear that Alejandro Iñárritu won this year’s Oscar for Best Director. The Revenant strikes an absolutely perfect balance between technical complexity and beautiful simplicity. We can heap as much praise as we want upon the performances of men like Leonardo DiCaprio and Tom Hardy, but at the end of the day the most pivotal factor in the creation of a movie as raw and brutal as The Revenant is Alejandro Iñárritu. He’s the man who guides those who create the beautiful cinematography, and he’s the man who directs the perfectly acted scenes. Alejandro Iñárritu’s win makes an unreasonable amount of sense. While The Revenant tells an incredibly simple story, it does so in in equally incredibly complex manner. The job falls on Iñárritu to ensure that actors like Leonardo DiCaprio and Tom Hardy deliver believable yet nuanced performances while still maintaining the integrity of a true story. In the beautiful creation of The Revenant, Iñárritu utilized numerous techniques from his previous Oscar win Birdman that became his trademark style. However, unlike Birdman, the techniques he used took place not in a small, contained studio, but outside in a world that notoriously fought back against the production of this film. I’ve said it before: the fact that a movie was difficult to make doesn’t make it worthy of an Oscar, but a director’s ability to hold everything together and create a work of art as wholly beautiful as The Revenant most certainly is deserving of Oscar recognition. Of course, that’s the beautiful thing about the world of film: it really isn’t a black and white affair. Who do you think deserved to win this year’s Best Direct Oscar? Let us know what you think in the comments and keep the conversation going!